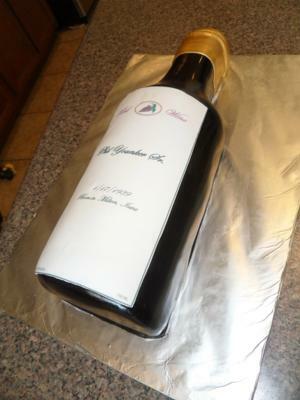 This wine bottle cake was so much fun to make! I started off by baking 2 13"x18" yellow cakes. I wrapped in cling wrap and froze over night. I took them out of the freezer and filled with buttercream and restacked. I took a cake board and cut a half circle to use as a guide for how large I wanted the bottle. I would hold the cake board with the half circle cut out to the cake and start carving the frozen cake into that shape. I just kept carving the cake using my half circle cut in the cake board as a guide. I had to keep putting the cake back into the freezer about every 10-15 minutes and refreeze for 20 minutes or so to keep it firm enough to carve. Once the bottle was carved I had to look at a picture of a wine bottle to carve the neck. Once you are happy with the shape of your wine bottle, refreeze for about 30 minutes. Dirty ice the cake. I covered my cake in white fondant, you could also dye the fondant black first then cover it if desired. After covering in white fondant, I airbrushed the whole thing black. Now, the fun part is to make the cake look extremely shiny, like glass! You can't tell very well in the pic, but I was thrilled with the results I got, it looked JUST like glass! You take one part vodka to one part corn syrup and mix. Paint over your cake (once airbrush is dry) with a paintbrush. This takes a few hours to dry, but when it does it's absolutely gorgeous! I made a wine bottle label on my computer with the birthday guys name, DOB, birthplace etc. I printed it the size I wanted it on the cake and took it to my grocery store bakery where they make it into an edible image for me for under $7. I placed the image on a piece of white fondant first. I was afraid if I placed it directly onto the cake it would bland in too much with the black. So, I stuck in on a piece of fondant, then onto the cake. It worked great! Next, I covered the mouth of the bottle with white fondant and colored it with an edible gold paint. I was thrilled with this cake, and you will be too! This is so real looking, just amazing. You did a wonderful, wonderful job. I give you a ten **********. keep it up. Wow!! Impressive!! I love it and will deffinetly try this.